The monuments of the Alhambra and the Generalife in Granada another year have been the most visited monument in Spain, with over 2 million visitors a year. The Al-Hamrat, in Arabic the Red Fort, is a wonderful jewel of Nasrid architecture of the thirteenth century, impressively situated on a hill, with Sierra Nevada as a backdrop. Being Granada the last stronghold of the Nazari kingdom during the centuries of reconquest in Spain, this impressive castle was both a military fortress with thick walls and royal residence of delicate beauty, surrounded by forests, gardens and orchards, where the summer palace is located in the Generalife. After the reconquest, the Alhambra was for a time the Royal House of the Catholic monarchs Ferdinand and Isabella. Their grandson, Charles V built a striking Renaissance palace on the grounds, reflecting in the monument the transition over the centuries of cultures as diverse as Muslim, the Renaissance and the romantic. A visit to the monument itself is complemented by an offer of museums, exhibitions and culture, among which is outstanding the International Festival of Music and Dance in the summer, with outstanding performances in the beautiful setting of an illuminated Generalife, awash with the perfume of Jasmine, Queen of the Night and Honeysuckle. 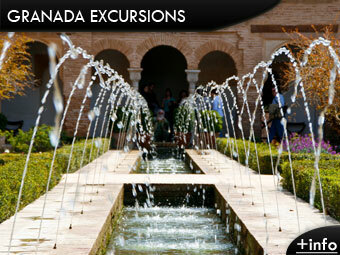 The grounds of the Alhambra consist of three main areas which are the Alcazaba, the Nasrid Palaces and the Generalife. The Alcazaba is the oldest part of the fortress, with thick walls and watch towers looking over the plains of Granada. The Nasrid Palaces are three in total, each from a different era. The Generalife was the summer residence, with gardens, fountains, patios and orchards. In recent years has been established a strict schedule to visit the Nasrid Palaces, the access time being indicated on the ticket. We recommend purchasing the tickets in advance, since at the entrance are only sold tickets that have not been sold by other means; thus there are not guaranteed tickets for the same day or a specific time. There are several types of tickets available offering more flexibility to the visitor, according to your preferences. There are visits in the morning and evening. The General admission, for 13 €, includes daytime visit to the whole monumental complex. The Garden visit for 7 €, includes visits to all areas except the Nasrid Palaces and therefore access is not controlled by that rigid timetable; the visit is limited only by the morning or afternoon timetable indicated on the ticket. Night visits for 8 €, offer the possibility of touring the Nasrid Palaces or the Generalife Gardens in the evening, enjoying the special lighting. The Blue Circular Tour, for 15 €, allows to visit the Nasrid Palaces at night and visit the rest of the monument during daytime on two consecutive days. Plus there are the Guided tours around the Urban Environment for 25 € and the Alhambra's Exclusive Tour, offering a more intimate and private approach to the Alhambra. The monumental site is open Monday through Sunday, with different opening hours in summer and winter semesters. From March 15 to October 14, box office hours are from 8 am to 7 pm and visiting hours from 8:30 am to 2 pm (morning ticket) and 2 pm to 8 pm (afternoon ticket). From October 15 to March 14, box office hours are from 8 am to 5 pm and visiting hours from 8:30 am to 2 pm (morning ticket) and 2 pm to 6 pm (afternoon ticket). To enjoy the visit of the Alhambra we recommend planning the tour of the site a little bit in advance and thus you might find it interesting to know that the general route adds about 3.5 kilometres and takes about three hours. Therefore, it is convenient to be equipped with good walking shoes and water, and especially during the summer months, with a good sunscreen and hat. It is also important to plan some breaks. There are several points on the site where to buy refreshments and there are toilets. More information about the location of these points as well as maps of the monumental enclosure etc., can be downloaded from the official website http://www.alhambra-patronato.es/ , where you can also purchase tickets online. You can get to the Alhambra by foot, bus or car. There is public parking next to the monumental site. In any case, the Tourist Board recommends going early enough due to the large influx of visitors at the entrance to the Alhambra, especially during weekends and holidays. If your time is limited, you can visit the free areas of the Alhambra and Granada. Our recommendation is to check a quote for an Alhambra guided tour in Granada from a trusted website like Malagaholidays.com. Plan your visit to the Alhambra during the opening hours in advance, or your trip if not going with a guided tour to the Alhambra will end with a simple visit to Granada city without visiting this beautiful monument.